For my appearance on Morning Air with Sean Herriott on Relevant Radio today. The Bible is a Catholic book written and collected, preserved and copied, codified and canonized by bishops of the Catholic Church. It is our book to read and study and learn. Today’s Catholic is called to take an intelligent, historical, and spiritual approach to the Bible. QUESTIONS FOR ‘BIBLE CHRISTIANS’ that they can’t answer! For excellent Catholic Bible studies (some of which I have written) visit CatholicScriptureStudy.com. Also check out my web page for Bible Study. 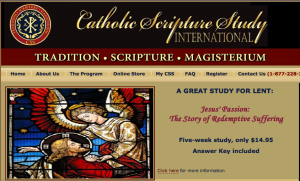 My article Should Catholics go to Non-Denominational Bible Studies? 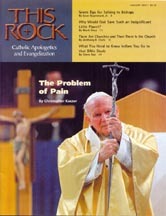 appears in the January 2007 issue of THIS ROCK Magazine. In the article I recommend another article I wrote entitled How To Start A Parish Bible Study. In addition, here are a load of other Bible Study resources–click here and here. and You Can Join our Ecumentical Bible Study, but Catholics — Sshhhhh! “The Bible is so thick and confusing. Mary dusted off the big book and tried reading it several months ago, but she thought it would be a huge help if she could find a good Catholic Bible study—a class where Catholics could study the Bible together. 2. There is no official binding interpretation or interpreter; each person ultimately is their own pope; (No prophecy of Scripture is a matter of one’s own interpretation 2 Pet 1:21). 1. The authority of the Apostles and the Church preceded the Bible and the Tradition of the Church is an equally infallible authority (2 Thes 2:15; CCC 80 83). The Bible is part of the Apostolic Tradition. 4. Individuals canshould read the Bible and interpret the Bible for themselves—but within the framework of the Church’s authoritative teaching and not based on their own “private interpretation” (2 Pet 1:20-21). These basic differences place the Catholic and Protestant worlds apart even though they are opening the pages of the same book and accepting it as an authoritative revelation from God. The Catholic position is biblical, and has been espoused from the first days of the Church. The Protestant position is unbiblical (assumed from their tradition) and is of recent origin. The Catholic is in full continuity with historical Christianity; Protestants are in discontinuity.